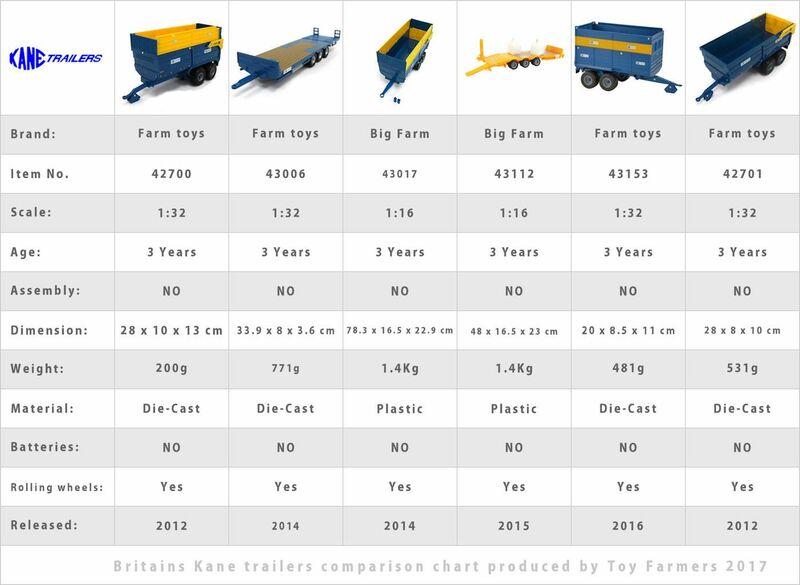 As it stands Britains have five Kane trailers in their collection, with silage and low loader trailers in 1:32 and 1:16 scale respectively. 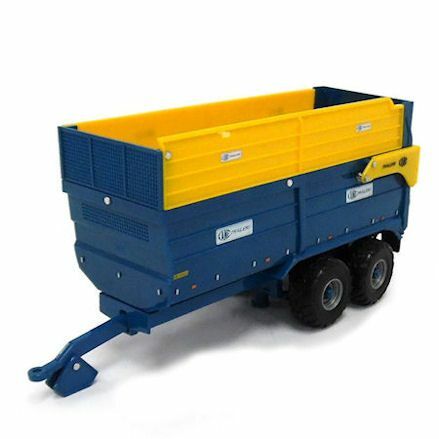 Based in Northern Ireland manufacturing agriculture and construction machinery for more then 40 years, Britains have now honoured this fine company by introducing their farm trailer range as replica models - available since 2011. 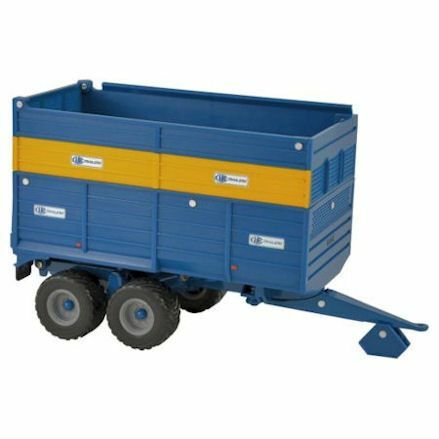 Over the years, Britain have released a mixed lot of toy trailers, starting with the Kane silage trailers to the more recent low loaders for hauling machinery and large general farm sundries. But let's be clear, all these models are children's toys, sure they can be collected but each and every one of them are for child's play. 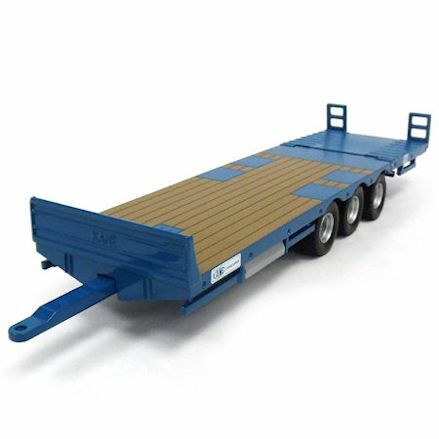 Take note, these Britains Big Farm Kane trailers should be compatible with Bruder tractors in 1:16, well the 1:32 range should fit with Siku tractors. With six current Kane models in the series, four were released into the 1:32 scale farm toys range, well two were released for the Britain Big Farm range. 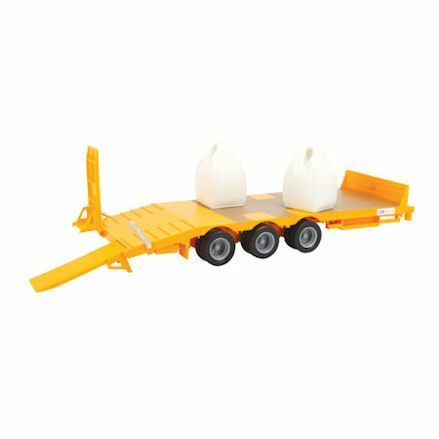 With both sets of Big Farm trailers and 1:32 scale available, they do offer features that are pretty much identical, but as you can imagine, they're constructed way differently. In the 1:32 scale range, these models are all made in die-cast metal, with a few plastic parts, metal fixings and rubberised tyres. Likewise, this Big Farm trailers in 1:16 scale really allow the detail in these Kane trailers to really shine through. Be sure to go with either model that is suitable for the child's needs, and just make sure you stay in scale, failing to do so will result in a product return. Being a larger model or a medium size 1:32 scale trailer shouldn't stop functionality and playability, and they haven't here, with both ranges offering working parts. As expected all wheels are free rolling, they sit on a light suspension on a twin or triple-axle, with the tyres made from a rubberised like material. Naturally a bigger trailer will allow more functions to be included, but not so with Britains. Big Farm and 1:32 farm toys all have the same tipping action, opening tail gate, with a folding down/fold up ramp where applicable. The simple hole tow bar quickly and easily connects to the corresponding tractor hitch only, but either one is not so compatible with the Britains Land Rover series, due to the size difference - so just buy for tractors. 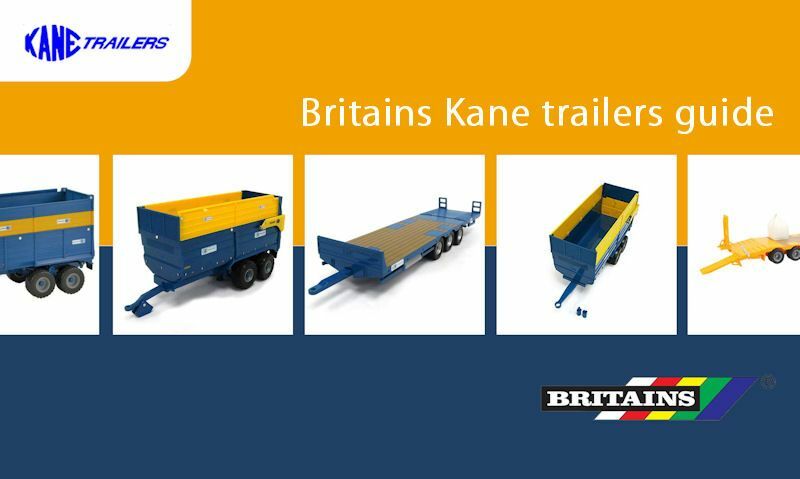 See how all these five models compare when side by side, which should help you make the right decision when choosing a Britains Kane trailer. 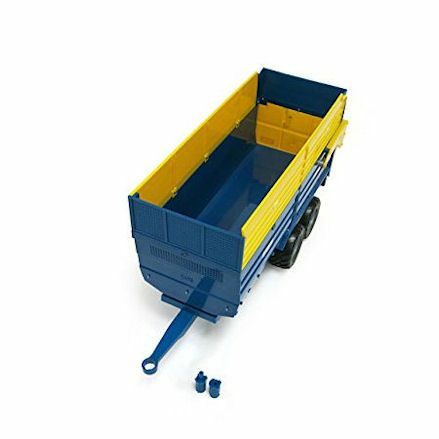 This 16 tonne silage trailer features original exterior decal detail, front mounted suspension, rear tipping action and opening rear tailgate, free rolling wheels with replica tread detail, and a tow hitch for tractors to hook onto. Kane low loader trailer with triple axle to handle large amounts of weights, with raising and lowering beaver tail designed to allow for unloading and loading of machinery and farm sundries. Big Farm Kane trailer for hauling silage, features an automatic opening tail when the trailer is tilted up to empty contents, and a special spring loaded hitch to soften the impact on the tractor hitch when transporting heavy loads. Similar to but much bigger than the low loader above, this 'Big Farm' Kane low loader has a drop down loading ramp, tow bar hitch, three-axle with dual wheels, free rolling wheels and tire tread detail - complete with two large dumpty bags. 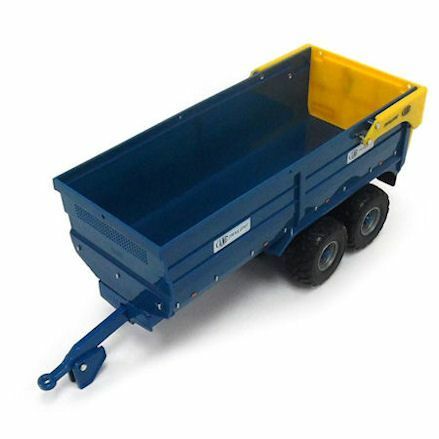 This 'Classic' Kane trailer is the most widely recognised and used in the collection, with this Britains 1:32 model featuring a tilt feature and automatic opening and closing rear silage door, including a tow bar and free rolling wheels. This 16 tonne 'grain' trailer has a front mounted suspension, rear tipping action, opening rear tail gate, free rolling wheels and tread tires. Hook up this model to any tractor in the 1:32 scale series.